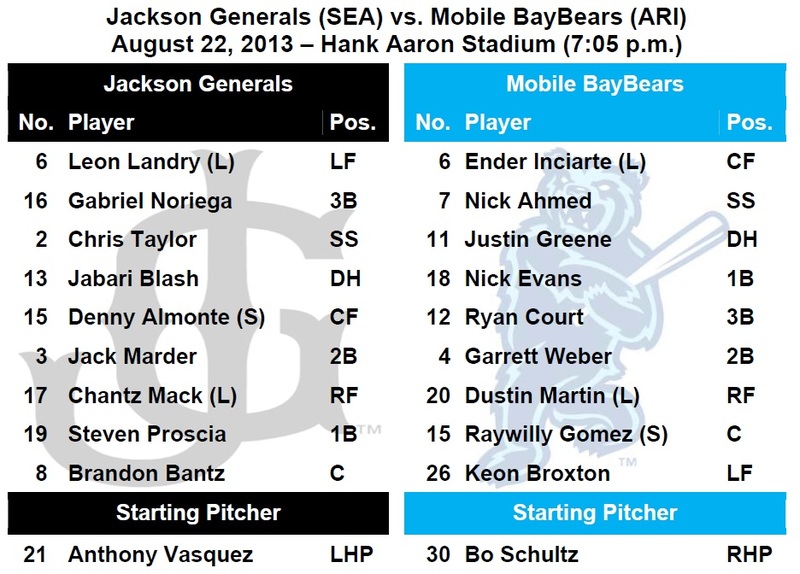 TODAY’S GAME: the Generals wrap up a 7-game series in 4 days tonight at Mobile (2-4) with the first 9-inning game of the set…this season Jackson is 6-8 against the BayBears and 3-6 at Hank Aaron Stadium…the Generals and BayBears played 6 games during the last 3 days and played 44 innings in 53 hours…Jackson begins the final homestand of the season starting Friday, a 5-game series vs. Chattanooga. GENERALS RECAP: Jackson dropped their 2nd straight doubleheader to the Mobile BayBears (32-27) with 1-0 and 2-1 losses on Wednesday at Hank Aaron Stadium. Both games featured sharp pitching and little offense. The BayBears take the series with the win having won four of six in the seven-game set. The story of game 1 was pitching. Trevor Miller (ND, 2-1, 4.04) tossed what could be considered his best start of the year going 7.2 shutout innings, allowing only 4 hits. Miller did give up 4 free passes in the game, but struck out 5 in the no decision. The right-hander threw a season-high 110 pitches but never got any run support thanks to Mobile starter David Holmberg. In game 2 2B Jack Marder (1-2, HR, RBI, R) was the lone offensive spark with his solo shot in the 2nd. It was his 4th long ball of the season. RF Chantz Mack (1-3, SB, K) made his debut with a hit in his first at-bat. DH Jabari Blash (1-1, 2 BB) stayed hot by reaching base in all three at-bats in the game. Left-hander Cam Hobson (L, 0-1, 3.00) in his AA debut threw 109 pitches through 6 innings. He gave up 2 runs through the first 3 innings, but shut the door after that. Hobson scattered 7 hits, walked 4 and struck out 4. 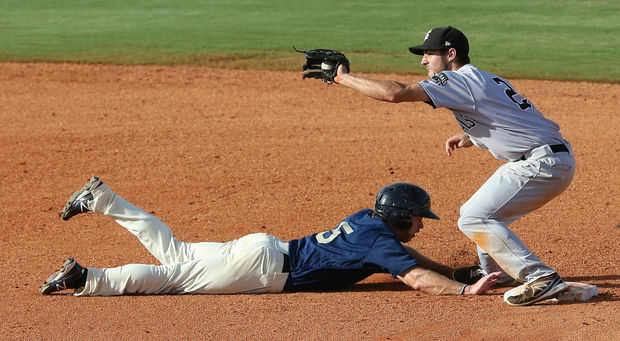 • MOBILE MEGA BOWL BY THE NUMBERS: The Generals played 6 games in 3 days August 20-22 at Hank Aaron Stadium in Mobile. The 3 days included 44 innings in 53 hours, 2 extra inning games, 3 1-run games and 14 hours and 37 minutes of game duration. August 20th games were not considered a doubleheader because G1 was the completion of a suspended game from August 6th. • CLOSING TIME: After allowing 5 runs over his first 6 appearances of the season, RH Carson Smith has allowed only 5 earned runs over his last 33 relief appearances. During this stretch he is 0-1 with 9 saves and a 1.12 ERA (5 ER, 40.2 IP). Since April 22, Smith has lowered his ERA from 8.44 to 1.96. Smith has struck out at least 1 batter in 35 of 40 games (64 strikeouts). • ON THE ROAD AGAIN: The Generals are making their 2nd trip to Mobile in 2 weeks and playing 7 games in 4 days including the resuming of a suspended game and 3 doubleheaders in 3 days. 6 of Jackson’s final 11 games will come on the road. • OFF WITH A BLASH: OF Jabari Blash currently has a 5-game hitting streak and has a hit in 13 of his first 18 Double-A games batting .306 (19×62) with 5 of his 19 hits being home runs. Blash belted a homer in his first Jackson at-bat on August 2 at Mobile…hit 2 home runs vs. Montgomery on August 15. He leads the Mariners farm system with 21 long balls this season. • TAYLOR HAVING A GREAT AUGUST: INF Chris Taylor is batting .325 (27×83) with 15 runs scored, 2 doubles, 1 triple, 6 RBI, 10 walks and 5 stolen bases in 22 games in August.